I've been entirely correct on all counts about lead poisoning risks here, including that my children would be at high risk of getting lead poisoned in my parents' 1920s mansion in Shaker Heights. I've been correct about everything regarding information technology here as well. To complete eradicating lead poisoning in Northeast Ohio in 2010, as I committed to do, in 2005, I will bring the problem solving where problems are solved best - realNEO. I am furious to think back on how I was treated over the past five years, as I worked hard to raise community awareness of the dangers of lead poisoning - like CHICKEN LITTLE! Same way as I've been treated regarding IT. I proposed specific solutions to address the problem of lead poisoning in Northeast Ohio including INSPECTING INSIDE HOUSES IN SHAKER HEIGHTS - I was completely disrespected in every way in dealing with this. I provided IT solutions here, at my family's expense, and was disrespected here. We made too little progress as a community dealing with a lead poisoning crisis, for the past five years, and 1,000s more children were lead poisoned than necessary. We did just as poorly as a community with Information Technology, except for with realNEO. Don't think I'm going to let my children's leaders off easily for lead poisoning my family, and thousands of others in Northeast Ohio, each year.... or for dis'ing realNEO and my work with Information Technology. I'm done dealing with poor leaders - this year they all go. Past leaders of Northeast Ohio had better be very prepared to handle the truth about their performance as our PAID representatives, to their graves, because the truth and reality of their poor outcomes has included lead poisoning 100,000s of children, and they will surely pay for lead poisoning mine. First DEMAND of our leadership, to insure we address lead poisoning in Northeast Ohio this year - all public and private property where children may go must be inspected for lead hazards. Where there are hazards, children must be removed and kept away until the hazards are addressed. No exceptions. I'd recommend making this apply for adults and pets as well, but my pledge is to address childhood lead poisoning, and this will address that. I'll explain how to implement as a separate posting... it is cheap and easy to do, and will help grow our economy in many of the most important ways possible. Don;t waste my time here or anywhere ever expressing sympathies about lead poisoning to my family - my family is awesome. Just do your personal best to address the issue of childhood lead poisoning here in NEO, this year, so we may be done with this forever here. And if people call you chicken little for raising the issue of lead poisoning in NEO, smack them in the head with a lead pipe... I have several you may borrow. Submitted by Keith Winston on Tue, 03/09/2010 - 20:14. Norm i didn't know HAPPY BIRTHDAY!!!!!!! from Keith. Your child along with millions of children around the world are always in my PRAYERS and we need action about this. Who wouldn't help a child? I guess when it reach their homes and children which LORD i hope no other child has to suffer like this, Then will they see the light but will it be TOO LATE!! Submitted by Norm Roulet on Tue, 03/09/2010 - 20:21. Too lete for too many - you are enlisted in the army against lead poisoning. Submitted by Gone Fishin on Tue, 03/09/2010 - 20:24. You can enlist me. I will help you. Submitted by Norm Roulet on Tue, 03/09/2010 - 21:05. All those educated and informed people need to inspect all our lead hazards and identify where there are children at risk, and those children at risk need to be protected by fellow citizens and government. A huge problem is with lack of public education about lead poisoning, and citizens may do much arbout that every waking moment of every day - educate a friend about lead poisoning. Submitted by Norm Roulet on Wed, 03/10/2010 - 02:09. 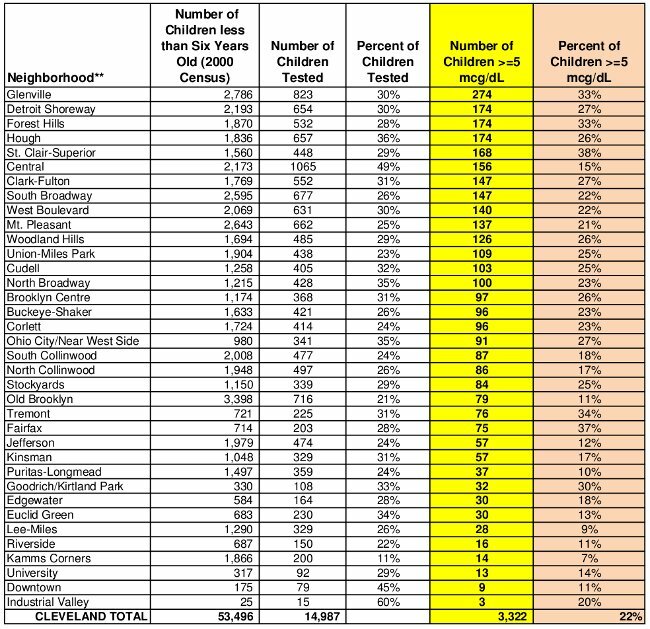 See this attached .pdf - http://realneo.us/system/files/LEAD_Prev_2007_CityCT.pdf - if you live in Cleveland or have friends or relatives living in Cleveland look up the neighborhood and see the percentage of children tested for lead and the percentage lead poisoned. Take responsibility for helping to solve this problem in a neighborhood that matters to you. We need 100% testing - 100% inspection - 100% prevention in all neighborhoods in the region. Start addressing the challenge by realizing how poorly we are doing addressing this issue today, and showing your disgust in that. Than, call your councilpeople, mayor, the news media - call EVERYONE and warn them about lead poisoning hazards in your neighborhood - TELL PEOPLE WE HAVE A CRISIS - YELL AND SCREAM - REMIIND EVERYONE MORE CHILDREN WERE LEAD POISONED IN CLEVELAND IN 2007 THAN DIED IN NYNY IN 9/11. Over 3,227 cleveland children under 6 years of age were lead poisoned in 2007 - probably nearer 10,000. What did we do about 9/11? What do we do about lead poisoning? Submitted by Norm Roulet on Tue, 03/09/2010 - 20:17. May doing the right things now make up for doing the wrong things in the past? We need to address that question at many levels in this community, as more and more wrongs become problems we must all make right together, despite past transgressions. its time to shun our "leaders"
Submitted by noner on Tue, 03/09/2010 - 21:39. I mean really - do we HAVE to follow them? I'd feel like an idiot if I did. we're so much better than all of this. Submitted by Norm Roulet on Tue, 03/09/2010 - 22:39. But that takes great sacrifice, as the false prophets and career politicians control all the money, and hire armys to follow them in doing wrong, against the citizens they all serve. Submitted by noner on Wed, 03/10/2010 - 14:03.
can't we just do it, and let it happen as it may? but it takes each of us doing the right thing. Submitted by Norm Roulet on Wed, 03/10/2010 - 14:19. I'm working on installing and configuring GRASS in an ICEarth Bigbang server this week - we are going to attack this open source and right, now. or somewhere far from NEO...? We can do this here or virtually - IT doesn't care. Submitted by noner on Wed, 03/10/2010 - 14:56.
literary criticism and aWAY from urban planning at the moment... most likely for ever. but i'm always happy to facillitate connections! Submitted by Norm Roulet on Wed, 03/10/2010 - 14:59. Submitted by noner on Wed, 03/10/2010 - 15:04. Submitted by Norm Roulet on Wed, 03/10/2010 - 15:11. Submitted by noner on Tue, 03/09/2010 - 21:40. Submitted by Norm Roulet on Tue, 03/09/2010 - 22:41. Submitted by noner on Wed, 03/10/2010 - 14:57.
i've already shopped - but would a cuddly, adorable, purring polar bear do? Submitted by Norm Roulet on Wed, 03/10/2010 - 15:01. Submitted by westward on Wed, 03/10/2010 - 00:16. Please relay a happy birthday wish to the young Mr. Roulet. May good health visit all children soon. Why is the above chart designed to downplay lead poisoning? Submitted by Norm Roulet on Wed, 03/10/2010 - 00:47. There is only one reason to use "under 12%", in green, no less, to present neighborhoods that are "low risk", rather than "under 10%" and that is to fool casual viewers into thinking some bad neighborhoods are good when they are actually bad (between 10-12%). All other categories are broken down in groupings by 10%age points, except the first. Geee, that makes downtown, Cleveland Hieghts, Lakewood and other "upscale neighborhoods" seem green. Why we have such a problem with lead poisoning - mind control to believe we don't have as bag a probnlem as we do. Submitted by westward on Wed, 03/10/2010 - 00:58. Norm, you know why if 10% is the age group and then it is used differently elsewhere, well, yeah, fraud. Maybe it is a marketing tool for real estate brokers. See, in this area, the levels are lower than 2 blocks away. Submitted by Norm Roulet on Wed, 03/10/2010 - 01:01. Submitted by westward on Wed, 03/10/2010 - 01:09.
money would be first on a long list of answers. We have been dealing with it here too, with the air born lead, the lead paint, and the lead tracked in on shoes that poison little ones that are trying to crawl, learn to walk, or spend time on the floor playing. By money, I don't mean the money that we spend trying to remediate lead in our homes. By money, I do mean corporate money. Submitted by westward on Wed, 03/10/2010 - 01:13. 31% of kids in Tremont were tested, and of those 34%, had lead poisoning. Submitted by Norm Roulet on Wed, 03/10/2010 - 01:30. It is disgusting, especially considering the money citzens waste on CDCs, on top of puiblic health services. Submitted by Norm Roulet on Wed, 03/10/2010 - 01:51. Low testing rates are a real problem in Northeast Ohio - you can't help a child prevent lead poisoning or feal with it in life if not tested. Better to know they are harmed by lead than think they have real behavior problems - they are victims of evil leaders, rather than flawed themselves. Approximately 34% of children living in Tremont trested as leadpoisoned in 2007, so the actual number of victims is probably near 200 per year, in Tremont alone. Submitted by Keith Winston on Wed, 03/10/2010 - 11:48. Well once again i think that not only bad leadership, but adults are also to blame if this is known why are only a few speaking up. It may be hard for one voice to be heard, but if all of the people that love and charish their children got together and shouted out loud YOU'RE KILLING MY BABIES, YOUR BABIES, MY NEIGHBORS BABIES, MY BABIES FUTURE BABIES, DEMOCRAT BABIES, REPUBLICAN BABIES, COUNCEL MEN AND WOMANS BABIES, CONGRESS BABIES, WHITEHOUSE BABIES ALL DIFFERENT RACES OF BABIES. Someone has to hear this cry but it's very hard for one voice to be heard. Lead is as dangerous as crack look how far that went. Only lead don't need a gun to kill. Let's scream together HELP OUR BABIES!!!!! Submitted by Norm Roulet on Wed, 03/10/2010 - 13:52. Everyone on Earth is within six degrees of separation from you - you know people who know people who know people who know people who know people who collectively know all people on Earth. All people on Earth may easily be informed about lead poisoning. People on realNEO know everyone in realNEO. Let's keep sharing this knowledge and awareness on realNEO, and ask all members to share that knowledge with everyone they know in the region. Thus, we increase public awareness and ecucation about the hazards of lead poisoning, among everyone in NEO. That alone will make a huge difference in eradicating lead poisoning here, in 2010. Submitted by ANGELnWard14 on Wed, 03/10/2010 - 14:17. If he completely guts, renovates, and rebuilds a brand new home in the city...it will still most likely test POSITIVE for high levels of LEAD.... The reason ultimately comes back to the uncountable Demolitions in Northeast Ohio. Those demolitions throughout the ages have resulted in LEAD DUST covering most of our city (exteriors of houses and on the actual streets and in our grass/yards). That lead dust is carried into the houses by wind and transference on shoes etc. It's almost impossible to escape it. This specific conversation was initiated out of his concern for me allowing my own child to play in our backyard. He came to me yelling at me that I should not allow my child to play in our grass in the yard. I was confused and then educated per the above about lead poisoning. Even though I had new carpet, freshly painted home, and so forth...my child still tested positive for lead back then. I met a low income family last summer who was facing losing their kids over the high levels of LEAD in their home. They could not afford to repaint it all and tried all they could to overcome the monster... It's crazy how the bureacracy of assistance helps with families caught in dynamics like that. I don't know how to avoid lead levels in Cleveland-other than to leave Cleveland totally. You can educate every person in Northeast Ohio. However, it will not stop demos, it will not cease construction sites from excavating, and it will not stop kids from playing in their very own yards.... all of which are harboring unknown levels of lead....we can minimize the levels...but not escape it as residents of Cleveland.... So, look forward to all of those new "DEMOS' going on in Cleveland. Submitted by Norm Roulet on Wed, 03/10/2010 - 14:35. They used to just smash houses into their basements and cover the debris with dirt when they demo'd houses in Cleveland. Now, all demolitions should be conducted with a constant spray-down of water to contain and reduce lead dust, and all debris should be taken off site and disposed of properly. Much of the lead dust in our soil is from when there was lead in gasoline... the neared major roads - especially older major roads - the more lead in the soil you will have. We need to take serious steps to deal with this, or leave the region. We took serious steps in East Cleveland and that worked well - our house is very safe and non-toxic. They don't take serious steps to protect citizens from lead poisoning in Shaker Heights, and my kids were poisoned there. Have dust mats outside by every door to your house and do not wear outdoor shoes inside at all. Have everyone entering the house wash their hands immediately. Only use vacuums with hepa filters! Take vitamins and keep all inner city children on vitamins, as healthy minerals may reduce the absorption of unhealthy minerals. Submitted by Norm Roulet on Wed, 03/10/2010 - 14:51. Don't forget about 12 tons of new lead dumped from the skies each year, from point source polluters. That's 24,000 pounds of lead. We measure lead poisoning in MICROGRAMS PER DECILITER... it only takes a few grains of lead to poison a child for life... 24,000 pounds is sufficient to poison a county. It seems the highest lead poisoning rates now are in areas near coal burning facilities, like my good neighbor Medical Center Company, dumping tons of lead dust on my neighborhood in over 75 years. Perhaps that explains the weird hater edge in Little Italy... everyone living there for long is certainly lead poisoned. Submitted by ANGELnWard14 on Wed, 03/10/2010 - 14:47. I appreciate your "basic" breakdown...your approach and dissemination should be published as is for the masses of parents who need that info...lots of families would amend their habits.... Excellent job! Wish we could send that one post directly to every parent of a student in NEO or give it to them in the labor/delivery rooms after birth! That might make a tremendous impact on our world.... and ultimately assist many with being part of the solution...Thanks again! Submitted by Norm Roulet on Wed, 03/10/2010 - 14:56. We can write it better and get it to everyone. Now that we accept the mainstream and alternative media are the problem, here, we must eradicate lead poisoning as citizens alone - victims of the media. Print it - spread it around - we'll put better materials together as able... every voice speaking out every day will make a difference. Submitted by Quest-News-Serv... on Wed, 03/10/2010 - 16:17.